I am Afshin Osanloo of the labor movement in Iran; I drive a transport truck between cities and am now in Gohardasht (Rajaei Shahr) prison in Iran. 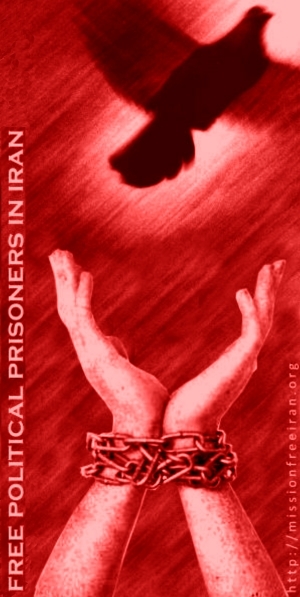 In the autumn of 2010, while resting in the dormitory for drivers in the passenger terminal, I was arrested by armed persons wearing casual clothing – not uniforms – and was taken to Section 209 of Evin prison. For five months I was kept in solitary confinement and was interrogated and tortured. The tortures included beatings of the soles of my feet with cables; forcing me to run on the beaten feet which were covered in sores and cuts; gross verbal insults and swearing; week-long interrogations, 18 hours at a time, while being beaten by a group of men which resulted in my ribs and some teeth being broken. During these five months, my family had no information about me whatsoever, and their inquiries were not answered. I was not even permitted one phone call to my elderly mother who also was suffering from my brother’s imprisonment (Mansour Osanloo, Chairman of the Syndicate of Workers of Tehran and Suburbs Bus Company). I am married and have two sons. When I first started my family, I began working at the Construction Base at Khatam, in the isolated, war-torn provinces of Southern Iran on important projects in the name of a driver for 2 years. The work was hard labor, such as building dirt roads through the Karkhe River, making docks out of rocks in the Port of Mahshahr, and building water pipes from the Karkhe River all the way to Hamideh in Ahwaz. The love for my country helped me endure being so far away from my family, and I dismissed the sorrow. After 2 years, all the drivers, whether they were temporary hires or contract workers, were let go. In 1997, I was hired by the bus Company of Tehran and worked 12 hour shifts both during the day and night on the busiest routes in the city. During the time that I worked at the unit, along with my most experienced and truly sincere co-workers, we tried to improve and modernize our working conditions and tried to prevent corruption at the expense of being humiliated and ridiculed by management and bosses from different sectors and regions and even the representatives of the Islamic Labor Council. Nevertheless, we pursued our outstanding arrears, bonuses, uniforms, and prevention of hard, harmful and unsafe labor, along with abolishment of temporary contracts, some of which had lasted 4-5 years. Although we were not successful in many issues, and were seen as greedy, ungrateful workers by the higher-ups, we still tried in any way we could. We were threatened with the loss of our jobs by the management. Unfortunately, in 2001, while I was transferring passengers during my shift at work, I had an accident that sadly caused the death of another person. I asked my company’s insurance for assistance in the matter but after some talks between the insurance company and the family of the deceased, the sum I was asked to pay was changed from 10 million to 18 million Toumans (Iranian currency). The insurance company from work was deemed legally exempt and not responsible. My complaints to the Department of Labor were of no use until the bosses of the company agreed to pay the entire sum, conditional on my resignation. And since I did not have such a large sum of money I was forced to resign, which caused me to lose the 4 years of seniority and experience I had in the field, not to mention the years of enduring hard labor and harsh conditions. This also dealt a large blow to my family. My wife, who was pregnant at the time, suffered from a nervous breakdown. From that time onwards, I was busy working in Transportation and Shipping. The fact that this sector was owned privately, along with the lack of strong, independent unions and late paychecks, made it hard for the drivers to make ends meet, and they suffered from so many different work-related issues. As a result, all of us were communicating about how to better our work situation. I had four rules in my life for myself which I have lived by all my life: I was proud of my work, I tried to respect all my peers, I loved my country and its people and I served society by bringing up my children well so that they could be useful. After one year of being in prison in sections 209 and 380, without knowing my fate, I was sentenced to 5 years in prison by Branch 15 of the Revolutionary Court, led by Judge Salavati (The Hanging Judge). In just a few minutes I was accused of being “a threat to national security” and was denied the right to be represented by a lawyer. I objected to the proceedings, but there was no way at all for me or my family to review or even see my file or my charges. I was sentenced on baseless accusations and charges to five years in prison, two of which I have already served. What did I do against national security? I had no political affiliations and did not belong to any organizations or groups and all my actions were legal and had to do with trade workers. The only crime I committed was pursuing workers’ rights and unions, and arresting us is not going to stop us from wanting our rights. It is necessary to create legitimate, independent labor unions for legal rights that are in accordance with the Ministry of Labor. And to provide job security, improved wages commensurate with the inflation rate, to prevent late payment of salary, permanent contracts between worker and employer, payment of social security by the government, insurance coverage for workers and to stop privatization of the transportation and shipping trade which are all privately owned in order to stop employers from taking advantage of the workers. If such issues are pursued by the police force and the Ministry of Transportation, it will allow the trade business to run in accordance with the law. If these laws are implemented, it will benefit public safety and increase productivity, and the industry as a whole will be more profitable. My crime and that of all others like me are the same and repetitive on this issue. These issues and problems are discussed among drivers and workers, and even amongst some honest and competent transport managers who work for the industry. These issues should be first addressed to The International Transport Workers’ Federation (ITF) and also the International Labor Organization (ILO), who have always been sympathetic and have supported their brothers all across the world, and who understand our pain and suffering. We want them to take this issue to the international bodies and communities and also to the human rights organizations. We want all other workers, especially those in transportation, to hear how I and so many other workers have been unfairly and illegally convicted. We want you to tell them how in our country, we have no labor or human rights, and how unjust and illegal it all is, and how the smallest complaint about our working conditions causes us to be severely tortured and imprisoned.